When you suffer from anxiety, you tend to only think about the bad. Things that could happen. You’re constantly worrying and afraid. It is quite awful. However, in an attempt to keep up my journal posts to encourage each other on our individual journeys with mental illness and my own personal attempt at breaking the stigma. 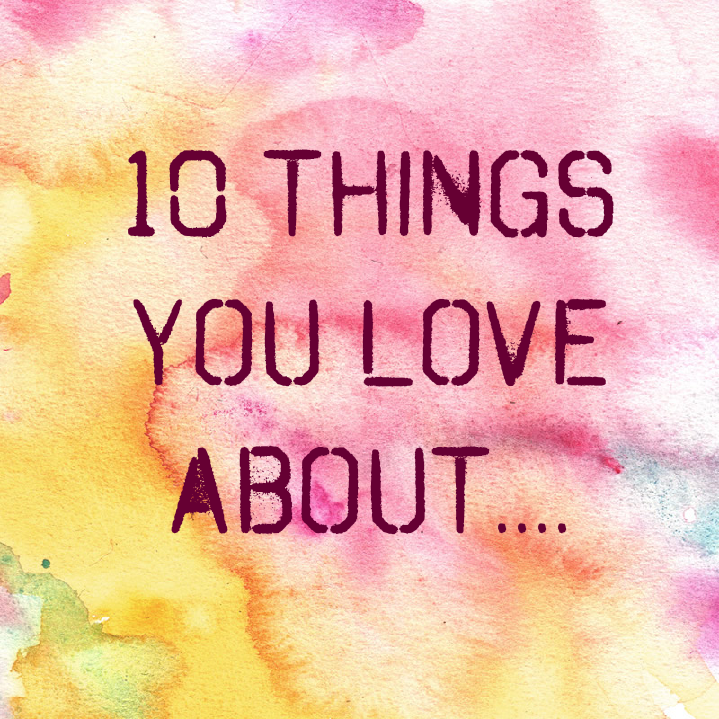 So this journal entry is 10 things I love… today I am choosing my mom. My dad was an abusive alcoholic. Now my mom says that the relationship wasn’t always that way but the more he drank the more abusive he was. It got worse when he stopped being able to find a job. She just took the abuse, grinned and beared it and kept on. But then he started being mean to my brothers. That is when she started standing up against him, which made the abuse to her worse. The final straw, I was born. Being a girl, she was worried his abuse towards me would be far worse than the boys. So when I was about 1 or 2….she left. She got custody of us and she left his abuse. You do not know how strong a person is to leave a controlling abusive relationship. She willingly left with all 3 kids to be a single mom. It was never easy. My brothers are a handful. I know all grandparents love their grandkids but my mom seriously loves my kids. She spoils them to death. More than her other grandkids. She will come over at 6 am on Christmas morning when its 12 degrees outside to watch the girls open their gifts. She goes to every single function for my oldest daughter. She would spend the last dollar of her disability on the girls. She allows my oldest to stay the weekend almost every weekend. And I allow it. Why? Because there are only so many years where a child wants to be around their grandparents. 3.) I never disappoint her. Now that is not saying that I haven’t done things that could have disappointed her or should have disappointed her. I have. I mean I am only human. But she is always understanding. When I got pregnant at 19. I was terrified to tell my mom. But she wasn’t mad. She actually said…it happens. We’ll handle it together. She is also very understanding about my anxiety. She tries very hard to help me be less anxious. I text a lot and I think the person I text the most is my mom. Honestly. I talk to her every day all day. She is my best friend. Even if I wake up at 3 am and text her. She usually texts back as soon as she wakes up. She is actually over at my house about 6 days a week. She usually heads home after I cook dinner. That way she doesn’t have to cook. Even when I was a kid…she never sugar coated anything. If she had a short paycheck and had to make a decision on whether she paid the water bill or bought groceries. She never made that decision alone. She always talked to us about it. She always asked us what we wanted. She never tried to make things sound better than they were. And it made me understand things a lot better. I am a cooker. I love to cook. And I love to experiment with my recipes. As long as it is not too spicy she is willing to try it. I don’t eat steak and my mom doesn’t eat steak. However, my husband does and occasionally I’ll make him steak as a specialty and she will try it to make sure it is seasoned just right or tender enough. She’s amazing. My mom never really cooked when I was a kid. I mean how could she. She worked all the time. She was a single mom. And what she did cook, she usually burned. I’m not being mean it is the honest truth. However, her deserts and bread was the best thing in the entire world. My friend specifically asks for her peanut butter cup pie and pumpkin bread all the time. Not only did she fight tooth and nail to make sure she got herself and us out of that house. She continued to give everything for us. She didn’t bring men around us. She didn’t drink in front of us. She never did drugs. She always worked. When we couldn’t have Christmas, we would have Tax Time. which after catching bills up, whatever was left of the tax money would be spent on us anything we needed and wanted. She still gives even though she’s on disability. I know in this post I am talking bad about my dad. But I didn’t really know him. I know he passed away recently and I am very sad about that. I did wish I could have had a relationship with him. But life doesn’t always work out how we wanted. Although they were separated for most of my life, they were still married. My dad was court ordered to pay child support. Which he hardly ever did. So everything we needed to survive. My mom had to provide all on her own. My oldest brother was a trouble maker. A real trouble maker. So, there were many times where she could have just given up. But she never given up. She always kept trucking and pushing forward. 10.) She is always there. I know I already said that she would come at 6 AM for the girls. But honestly she would do that for me too. If I called her right now and told her that I needed her here right now….she would get her shoes on and come. She’s my mom. But she’s also my best friend.